GABA (gamma-aminobutyric acid), an amino acid and a key inhibitory neurotransmitter, may help support a calm mind as well as muscle relaxation. Neurotransmitters are chemical messengers that carry information between nerve cells or from nerve cells to other target cells. 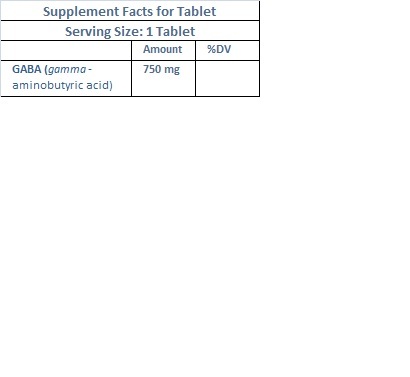 GABA is synthesized in the body from glutamic acid where its function is to have an inhibitory effect on the firing of neurons. RECOMMENDED USE: 1 tablet daily. Suitable for vegetarians. Contains no yeast, dairy, egg, gluten, soy, wheat, sugar, starch, salt, preservatives or artificial color, flavor or fragrance. Other Ingredients: sorbitol, stearic acid, modified cellulose gum silica, and magnesium stearate.